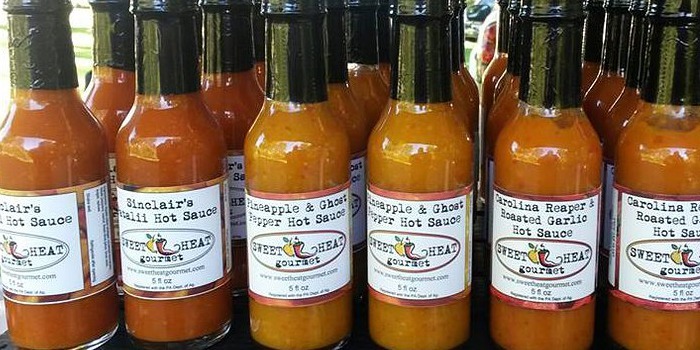 Sweet Heat Gourmet began in 2011 with Chef Michelle Mierwald committing to crafting fresh hot sauces using locally sourced chile peppers and ingredients. Fast forward 2 years, and Sweet Heat Gourmet currently offers over a dozen products including seasonal and special batch sauces. Michelle and David Mierwald were approached by a young man named Sinclair, with a basketful of Fatalii peppers. He encouraged them to make a sauce with the Fatalii peppers. 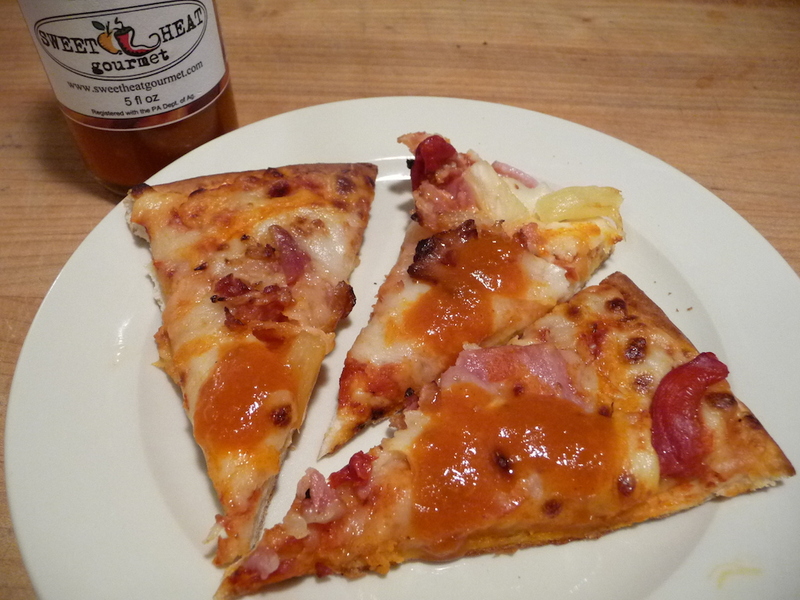 Doubting that it would ever be a success, they crafted what would become Sinclair’s Fatalii Hot Sauce. The Fatalii Chile Pepper has a sweet fruity and citrus flavor and Sweet Heat Gourmet has found an almost perfect match with it and their added ingredients. Ingredients: apple cider vinegar, crushed tomatoes, fatalii peppers, carrot, fresh lime juice, lime zest, sugar, spices. 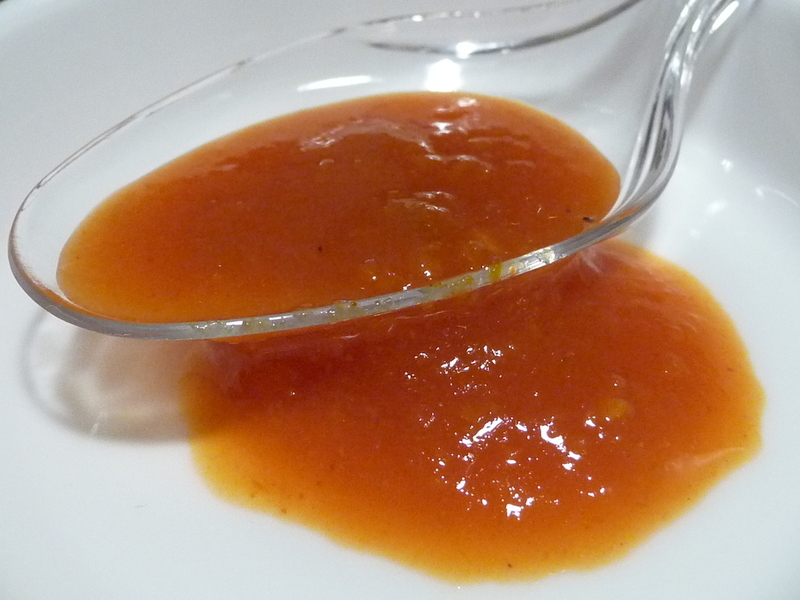 Texture & Appearance: Burnt orange in color, this slightly thick sauce clings nicely to the bottle and makes for a fairly thick pour onto foods. Nice. Taste Straight Up: Fruity, sweet and pungent, this delicious hot sauce has a very slow approach to get to the heat. The Fatalii Pepper itself is indeed sweet and citrus-y, and brings on a delayed heat that will please you. Fruity and warm. I am not a superhot fan by any means. I want some flavor with my hot sauces. But Ed Currie of PuckerButtPepperCompany recently turned me onto a few superhot chiles and I was just blown away by the intense flavor of them. This was before the heat kicked in. So I’m coming around. 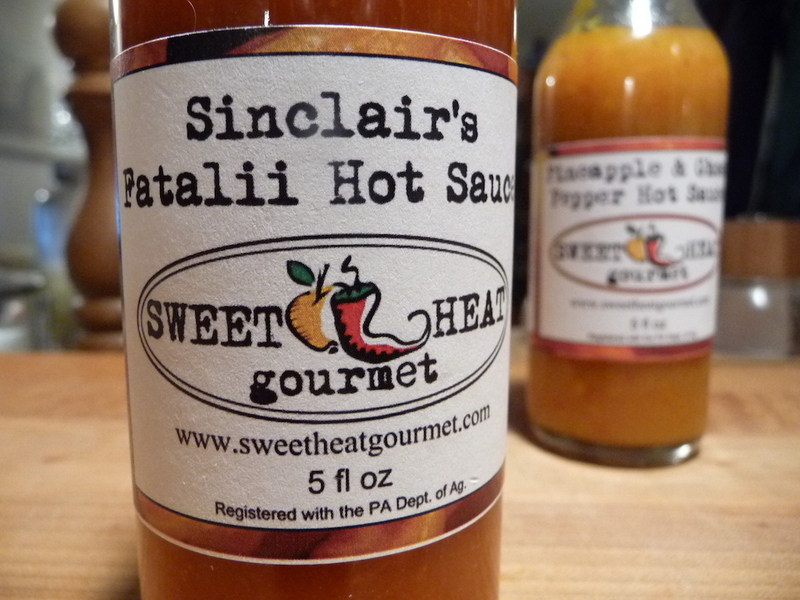 The more I ate Sweet Heat Gourmet – Sinclair’s Fatalii Hot Sauce, the more I wanted it. Again and again. Breathtakingly good. Heat Level: The Fatalii Pepper was rated as the 7th hottest pepper in the world (125 – 400,000 SHU) and so the slow, impending heat is quite remarkable, but not intolerable. Combined with the natural sweetness of the chile, and the fresh, locally sourced ingredients by Sweet Heat Gourmet, the heat is well balanced with the sauce. Surprisingly satisfying. Label/Graphics: Ironically, the labels are how Michelle and I met. Online, we had a discussion of her labels… I favored featuring each individual chile pepper within the main logo. Ultimately, and understandably, they opted for a consistent look across all products. I think the design is simple, fresh and classy. Kudos to Shellie and David. I love their logo and label. Simple and recognizable. 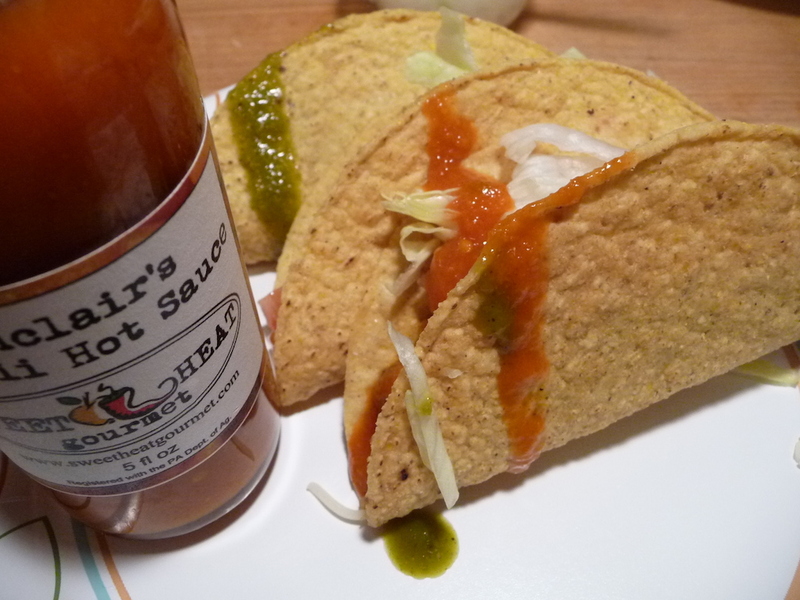 I tried Sweet Heat Gourmet – Sinclair’s Fatalii Hot Sauce on a few tacos and pizza, and I couldn’t get enough. It’s delicious, quite hot but for only a few seconds, and is bursting with flavor from both the chile pepper and the supporting ingredients. Highly recommended. With no offense meant to the kid that started it all, I would drop the Sinclair’s from the name of the sauce. It’s confusing and too long of a title. Sweet Heat Gourmet Fatalii Hot Sauce is good enough of a title for me. Drizzled on tacos it lit us up with flavor. Heat: 4/5 Stars – Up near the top of our heat/flavor scale. Bonus points for not completely debilitating our taste buds or ability to breathe. Overall: 5/5 Stars – our highest rating. – For heat level and balance of flavors. Absolutely a must try sauce. Period. Follow Sweet Heat Gourmet on Facebook. And look for them soon on Google+. Where to buy Visit their website at http://www.sweetheatgourmet.com/ and be sure to tell them HotSauceDaily sent you! Thank you so much for taking time to review our sauce Brian! We really appreciate your opinion and value your feedback. Talk to you soon and see you in NYC! Thanks, Shellie. I enjoyed reviewing it. Great review – looking forward to getting my hands on some for a virgin try. I hope you like it Tom! One of the very few superhot sauces that I enjoyed. Thanks for the review Brian! Thank you Dave. You do great things with your graphics and sauces.